Healthy Snacks are a must in our house. Pumpkin spice protein bites are a great way to have a small treat that’s a little sweet and won’t send your healthy eating intentions off the rails. Since it’s pumpkin season right now – and I love everything pumpkin – I wanted to share these with you. I met Jennessa through a friend and then she became my hairstylist. After years of having her do my hair, she has also become a great friend of mine. We are both incredibly busy and we don’t always have time to get together. But last week we managed to get in a hike. Jennessa is also a foodie and a total fitness junkie. We are always talking about recipes. On our hike I was telling her how I wanted to make a protein ball recipe that was pumpkin flavored. So of course after the hike, Jennessa went home whipped up a batch of these and sent me the recipe! Sign up to receive our email updates twice each week. Never miss a recipe! 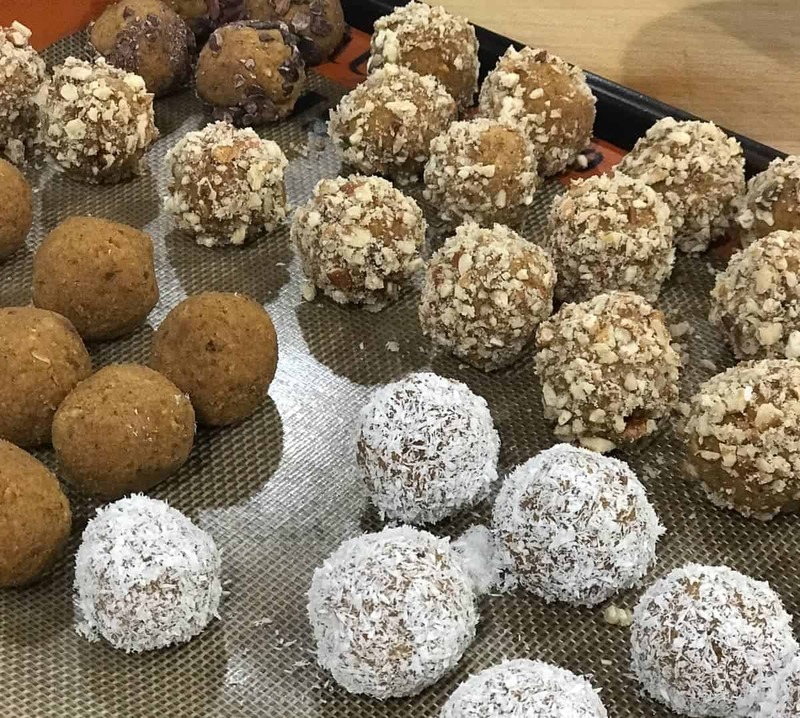 Healthy packable pumpkin snack balls. Purée the dates in a blender or food processor. Then add all ingredients into a bowl and mix up. Roll into balls. I used a small cookie scoop and got about 36 balls. Place on a parchment lined sheet pan. Optional: Roll balls in cocoa nibs, finely chopped nuts, or dried unsweetened coconut. Freeze and then put in a freezer bag to store. Note: After they are frozen I'll put them in a big ziplock and take out a few at a time to enjoy. You have to let them thaw a little. I usually pack them in my lunch in the morning, put them in the fridge and by the time I'm ready to eat them, they are fine. These look Yummy and, Yes, I like all things pumpkin :-). 1) I am allergic to coconut, can you suggest a different flour(would any flour work?) and sugar (can I just use more dates?) ? 2) What is your favorite protein powder. I have struggled to find one I like. I you could easy sub in almond flour here. And for the sugar it’s totally optional. I found that I didn’t need any when I made mine. So I left it out. I think I listed the sugar as optional. I use Progenex Tropical Vanilla. It has a great flavor. I have also used SFH with good results. Let me know if you end up making them. They definitely need to be kept in the freezer and then taken out the day you eat them. I still have a few in my freezer.